Eugene Hamilton has been an icon on the music scene for years. From his early days as the lead singer of The Stone Cold Boners, to the superbly suave machine the crowds flock to now, he’s renowned for delivering the utmost in ubertainment. 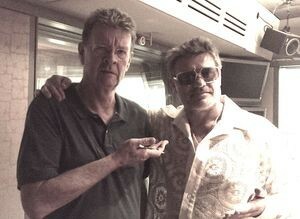 Interviewed by Red Symons on breakfast radio, Eugene explained his unique style of performance. Where does his testosterone drenched power cabaret come from? His lyrics give some insight. Eugene is a man who enjoys the finer points of life, and shares that joy with audiences the world over, singing “I’ve made love to life itself“. Not surprisingly, Eugene has been banned from China. His sultry lyrics and virile performances have upset the country’s one child policy, with too many children being conceived to the sounds of his voice. You can see Eugene in action at his regular Monday night gig at the Claypots in St Kilda, Melbourne. You can listen to more of Red’s interview with Eugene to get an insight into the one and only ‘world’s most living man’. Please contact Eugene for upcoming events or to book him for your next function.